There are special days in our lives that we treasure. My wedding day was one of the best days of my life. I spent ages planning the event, finding the perfect dress, shoes, flowers, jewellery and tiara. Some suppliers were easy to find but getting the right jewellery and tiara took time and effort - perfecting the right look, picking the right colour of jewellery and the right tone of tiara to go with my ivory dress was time consuming and difficult on times. I wish I had found Rosie Willett Designs then. 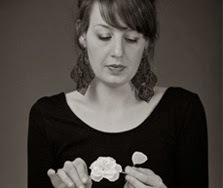 Rosie Willett is an award winning tiara designer with a First Class Honours degree in Fashion Marketing. Her designs are unique, and stunningly pretty. You won't find anything the same on the high street. From vintage inspired designs, to modern side tiaras and forehead bands and vines, Rosie creates special individual pieces for your memorable wedding day. Rosie in a matter of a few years has also become the darling of the Wedding magazines, being featured in such publication as Brides magazine and You and Your Wedding. She has even had a number of her beautiful pieces used in Coronation Street and been featured on the front cover of Hello magazine as her headdress was worn by Mrs Georgia Jones, for her wedding to Danny Jones from McFly. Rosie takes her inspiration from the shapes in nature and is also inspired by the cultures of art, film and fashion. The use of pearls, Swarovski crystals, silk satin and French lace inspire her to create jewellery, tiaras and headbands that are always feminine and beautiful. The workmanship of the pieces are obvious, each item is lovingly handcrafted and designed by Rosie to produce an individual stunning bridal accessory. Her wedding jewellery uses Swarovski AB crystal for that unique sparkle, as well as ivory pearls and diamante. Each piece has been designed to co-ordinate with her tiaras. From a simple pearl and crystal necklace to more elaborate designs, you are safe in the knowledge that you will look beautiful in Rosie Willett jewellery on your special day. Her bridal tiaras are made using intricate hand stitching and beading techniques. Vintage style headbands, decorative tiaras and glamourous hair combs are all part of her range. Prices are also competitive for hand made pieces, with a range of prices from simple decorative hair combs to more elaborate vintage style pieces. If you can't find exactly what you are looking for, Rosie provides a unique bespoke service too, for that perfect match on colour, theme or design. I think Rosie Willett Designs produce beautiful jewellery and headpieces. Tell me do you love the designs as much as me? Oh my god, the first and last headpieces are amazing! If I ever get married I'd love something like that. I think they are perfect to make you feel so special on your wedding day. Oh these are just so beautiful - makes me wish I was getting married again! That sounds lovely Dolly :) I think having a bespoke tiara made is a brilliant idea if you want to be truly unique. I agree they are and they would certainly make you feel special on your wedding day. Oh my goodness, these are beautiful. They have a real vintage feel, very twenties, My favourite is the bottom one. I think that one is my favourite too. I didn't know you were getting married. How exciting! Very delicate, intricate and romantic work, I absolutely love it ! Have a beautiful wedding !